(22 November 2017). Recent headlines about the State Department have been filled with drama and intrigue. While important, these accounts overshadow the important, day-to-day efforts responsible for building direct and productive relationships with foreign populations. These relationships, and the information that is exchanged as a result of direct ties, helps ensure that America’s messages and values are heard abroad despite all the noise that can dominate the news agenda. Today’s diplomacy is deeply intertwined with global communications technologies and platforms. This shift emphasizes the importance of public diplomacy, a term coined in 1956 by Tufts’ Dean of the Fletcher School of Law Edmund Gullion to refer to efforts at forging consensus among nations by molding the public opinions of foreign citizens. In an era of Twitter, ubiquitous connectivity, and disinformation bots, the public dimensions of the diplomatic repertoire supersede all others. Effective diplomacy requires a coordinated, multi-platform, public component. Public diplomacy today is, of course, much more complicated than it was years ago. The democratization of communication tools, combined with the emergence of a handful of globally networked social media platforms, means that all governments, as well as their anonymous proxy organizations, can compete for the hearts and minds of citizens. To borrow further from the field of economics, there are few, if any, barriers to entering the marketplace of ideas. During the Cold War, free information represented a scarce and in-demand resource for many living behind the Iron Curtain, a resource over which the West held a near monopoly. In 2017, information is no longer in short supply: people’s attention is an increasingly scarce resource. Competing for this resource—people’s eyes and ears—is an ever more complex and costly endeavor. Today, successful public diplomacy requires cutting-edge expertise in content creation, audience and market analysis, technological systems, emerging and established social media platforms, local media industries, not to mention a deep knowledge of the U.S. policies and values that drive every public diplomacy campaign. 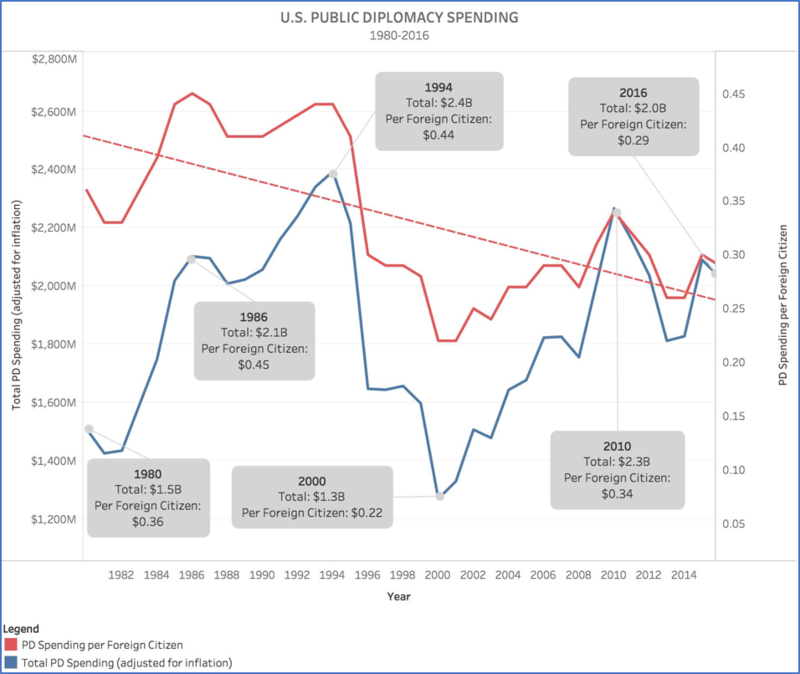 Considering today’s highly competitive marketplace of ideas, combined with a realization of the importance of engaging with foreign publics to combat extremism and foreign disinformation campaigns, one would expect historic levels of U.S. government public diplomacy spending per foreign citizen. This is not the case. Adjusting for inflation, in 1986, the U.S. government spent $2.10 billion on public diplomacy programs, or 45 cents per foreign citizen. As populations grew around the world, the United States decreased its financial commitment to engaging these new and strategically significant communities. In 2016—the most current fiscal data available—the U.S. spent $2.03 billion on public diplomacy programs, or just 29 cents per foreign citizen that we’re trying to inform and influence. Put another way, in 2016 the U.S. government spent 36 percent less per foreign citizen on public diplomacy programs than it did 30 years prior. 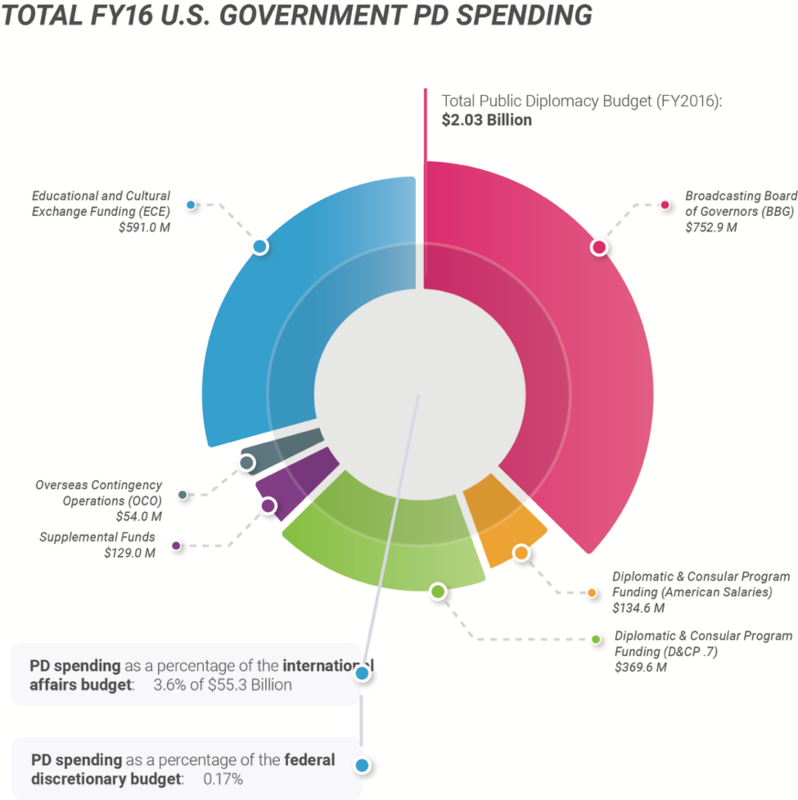 (Detailed fiscal data outlined here is available publicly via the 2017 Comprehensive Annual Report on Public Diplomacy and International Broadcasting). What money the US does spend on public diplomacy is well spent. It supports a multitude of programs and people, including: the creation of over 2000 weekly hours of original media content, in over 61 languages, reaching 278 million people around the world; over 75 exchange programs supporting nearly 55,000 U.S. and foreign participants, a number of whom are likely to become (or already are) political and economic leaders; 694 American Spaces abroad, which hosted over 44 million local visitors; regional media hubs that facilitated more than 1100 media engagements with government officials advocating for U.S. foreign policy in local media outlets; the modernization of and support for 260 U.S. embassy and consulate websites, in more than 50 languages, resulting in over 600 million page views; and, tens of thousands of post-managed small grants to local partners in support of the values and institutions that form the bedrock of our national security. Public diplomacy activities are the nuts and bolts that form the bedrock of America’s diplomatic presence and potential around the world. Without a continuous and public face, negotiations become far more difficult, especially in building support for an agreement among the local citizenry. However, public diplomacy represents a comparatively minor and shrinking portion of taxpayer dollars. The current appropriation amounts to 3.6 percent of the total international affairs budget, and just 0.17 percent—less than one-fifth of one percent—of the entire federal discretionary budget. As the Trump administration focuses on a more lean and efficient government, public diplomacy efforts deserve recognition for setting the stage and making possible the variety of ways in which the State Department can continue to create non-military solutions to conflicts and prevent the need to use costly military force. This is as good an investment as any considering that the entire public diplomacy budget is equal to, roughly, the cost of one B-2 bomber. About the author. Dr. Shawn Powers serves as the Executive Director of the Advisory Commission on Public Diplomacy at the U.S. Department of State. He’s also an Associate Professor (on leave) from Georgia State University and the founding Director of its Center for Global Information Studies.